Esports and video games are increasingly becoming an important part of India. Internet connectivity continues to improve and infrastructure issues are no longer as prevalent, allowing premium Internet cafes and passionate local professional gaming event organizers the chance to further the local esports scene significantly. While it’s been a longer road for the country, India’s esports obsession only continues to nestle its way into the mainstream conscience. If you live in India and want to bet on your favourite local and international esports tournaments, you will be glad to know you can do so on your computer, mobile smartphone or tablet, so long as you have an online connection. There are many betting sites and online sportsbooks that accept bets from Indian customers who want to wager on the latest matches and tournaments for CS:GO, Dota 2, League of Legends, Overwatch and many more popular and niche esports. EsportBet.com advises our Indian readers interested in betting on esports for real money (or cryptocurrencies such as Bitcoin and Litecoin) to visit and sign up at the following sportsbook sites. We have confirmed they accept Indian customers and have tested their available esports betting options to compile which have the earliest markets, lowest mark-up on odds, and best value bonuses and promotions. In addition, all host Indian-friendly payment options which you can use to deposit money for betting and withdraw winnings safely over the Internet. Below are the esports betting sites we reviewed and tested which provide the best options for Indian bettors. 1. Betway: Licensed and regulated by the Malta Gaming Authority and the United Kingdom Gambling Commission (for the United Kingdom only), Betway is the best esports betting site for Indians because it supports Indian Rupees (INR) as a betting currency, has a world-class reputation as a safe and secure online betting destination, and because it is heavily involved with the esports industry as a sponsor of top LoL team Ninjas in Pyjamas. Betway often has the earliest markets and lowest odds for major and minor esports tournaments held for CS:GO, Dota 2, LoL, OWL, Vainglory, World of Tanks and several niche competitive games. The one thing Betway currently lacks is full Indian language support, which we hope to see added in the near future. Read our full review of Betway’s esports betting options to learn more. 2. Arcanebet: Focused entirely on esports betting, Arcanebet is a newer sportsbook which has rapidly gathered popularity with the international community for the widest range of esports betting markets across both the most popular and obscure tournaments, something which not all traditional sportsbooks bother to offer. Indian players are welcomed at Arcanebet, though you will have to convert your betting currency from Indian Rupees to another option at the site upon depositing. You can claim an exclusive match deposit bonus at Arcanebet if you sign up via our links using the promo code, ‘esportbet’ at the cashier. Read our full review of Arcanebet’s esports betting options to learn more. 3. Pinnacle: Pinnacle is one of the world’s best esports betting sites, hosting a fully dedicated esports section/sportsbook unlike many other betting sites which tend to put esports by the wayside. Pinnacle are popular for consistently having the earliest markets and some of the lowest mark up on the odds out there, with a clean and intuitive betting interface (across both desktop and mobile versions) that makes placing a wager on your favourite tournament or match-up fast and simple. 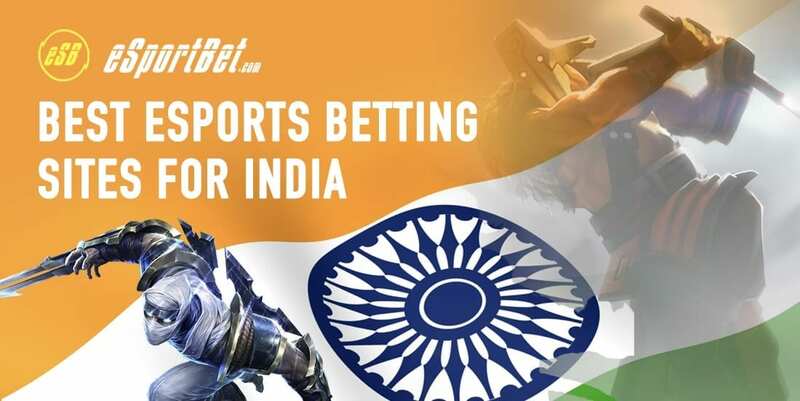 Pinnacle supports several popular esports betting deposit options for Indians, including Neteller and Skrill, though they do not currently support Indian Rupees, so you must convert currencies prior to betting at the site. Read our full review of Pinnacle’s esports betting options to learn more. As we mentioned previously, all of our top-reviewed and recommended esports betting sites offer markets on almost all major tournaments globally, and often offer options to bet on smaller, regional qualifiers and minors for the more popular esports games. We have provided a list of links to more detailed esports betting guides for each game you will find betting options for at online sportsbooks catering to India. Is it legal to bet on esports in India? Yes, you can bet on esports (and other sports and racing markets) over the Internet if you live in India. Many of the top-reviewed international esports betting sites accept Indian customers, allow them to bet on their platforms and are fully licensed and regulated in foreign jurisdictions. Online sports betting in India is presently unregulated by the government as there is no specific legislation which prohibits or restricts the act of wagering on a sport over the Internet, despite numerous calls over the years to create a country-wide, regulated industry. The Information Technology Act of 2000 comes the closest to applying to sports betting, but it predates esports by several years, so it offers no specific regulation for esports wagering, just general regulation of cyber activities with the intent to block certain websites. There has not been one single case of an Indian citizen being punished or fined for betting or gambling online. There are two minor exceptions only relevant to residents living in the state of Maharashtra and Sikkim: Maharashtra has completely banned online gambling, which includes sports betting, while Sikkim enacted the Sikkim Online Gaming (Regulation) Act in 2008. However, these local state laws do not apply or effect Indian residents living in other states across the country who wish to bet on esports over their computer or smartphone. Many forms of online sports betting, including betting on esports, is incredibly popular in India. We hope that the country does introduce legislation sometime soon to create a regulated and less ambiguous online sports betting industry, which includes and recognises esports betting. However, for now, just know that it is perfectly fine for you to bet on esports over the Internet in India, and that many foreign betting sites that are licensed internationally are reputable and safe for Indian customers. Even though India has no specific legislation banning online sports betting and esports betting specifically, many in the country have reported difficulty with depositing money into their betting accounts with traditional payment methods such as bank transfers, MasterCard and Visa. Occasionally, card companies and banks block sports betting-related transactions, so the most popular option for Indians are e-wallets and pre-paid services. These two types of deposit and withdrawal options allow Indians to deposit rupees into a digital account, which then can be used to convert their rupees and then deposit the converted amount into their betting account, effectively acting as a middle layer between personal accounts and betting accounts. Many Indians prefer these services, such as Skrill and Neteller, for their anonymity, privacy and security – and thankfully, many betting sites, including the ones we recommend for India, support these methods.